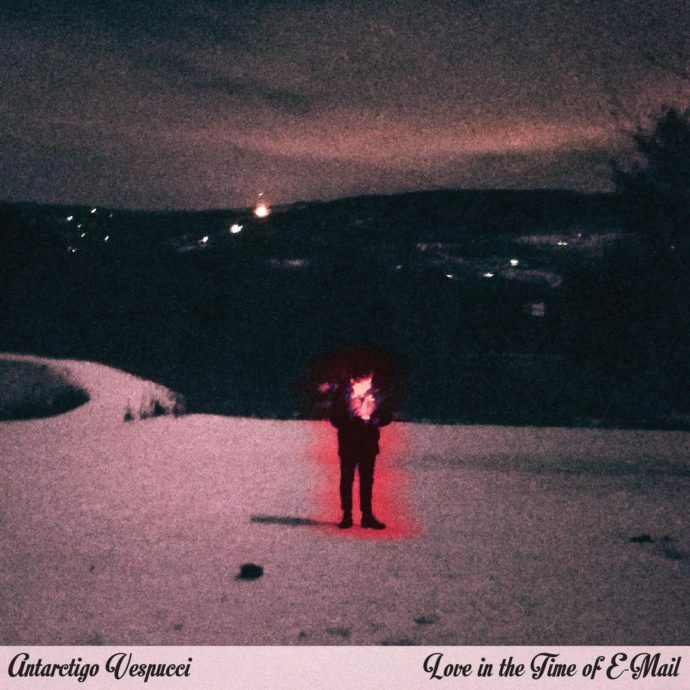 Love in the Time of E-Mail, the new album by Antarctigo Vespucci, is chock-full of backhanded and memorable hits. Not only are the tunes catchy, but they’re lyrically memorable, ironic in a self-deprecating way while poking fun at the digital age of love. The angst of an anxiety-ridden mirror placed in front of band members Chris Farren and Jeff Rosenstock is uncomfortably relatable, yet somehow easily faced head-on through pop-punk-alternative music that is undeniably arresting. Love is written through a grimace of sour grapes that can sometimes seem self-centered, but requires closer listening to break through the naivete of irony. The storytelling aspect of this album is genuine as well as painful, and it makes it hard to pick standalone tracks that could be considered “singles”. But what might be a problem for some bands is actually a solution for Antarctigo Vespucci. The flow of Love is fluid, not distracted by the thought of producing profit over product. The yell-along vocals and weighted guitars of Farren and Rosenstock’s punk roots, accented with playful synths and xylophones, are close to the vest and reeking with personality. There’s comfort in the honesty of this album and the lyricism is stunning. Tracks like “So Vivid!”, “Not Yours”, and “Another Good Thing” cause a physical reaction that is tethered in truth and musical genius. Connecting to an audience can be one of the biggest challenges for any band, but the connection that Farren and Rosenstock have forged with each other is special enough to invite the rest of us along. Love is powerful, memorable, and ornate. After only a few listens, it becomes etched in the mind, the production so clear that each heady guitar riff, destructive downbeat, and twinkling synth pop comes through with its own powerful message. In an anxiety-driven and depressive world, Antarctigo Vespucci is one of the only bands putting a name and face to what so many are feeling. This album is a soundtrack perfect for its time while also being a masterclass in the human condition. Don’t miss it.